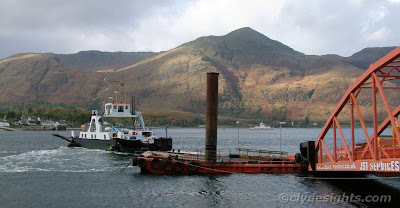 The ferry service across Loch Linnhe at the Corran Narrows is operated by Highland Council using either CORRAN, seen lying at a mooring in the distance, or the smaller ferry MAID OF GLENCOUL. Some time ago, it was discovered that the slipway at Nether Ardgour was suffering from extensive erosion and that repairs were urgently required. To allow a ferry service to be maintained while civil engineers set about rebuilding the slipway, a temporary solution was sought and a spud-leg barge brought to the site. The temporary arrangements, which allowed traffic weighing less than 3 tonnes to continue to cross aboard MAID OF GLENCOUL, were restricted to operating during daylight hours only. It is hoped that repairs will be complete by the end of the year.